A How-To Guide for Students and Teachers. Instructional. Jazz, Instructional and Theory. Instructional book (softcover) and examples CD. With introductory text, instructional text, standard notation, chord names, musical examples and glossary. 197 pages. Published by ABRSM (Associated Board of the Royal Schools of Music) (HL.290534). ISBN 0634033115. 9x12 inches. Dr. Charles Beale. 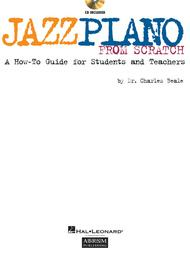 Jazz Piano from Scratch is a complete step-by-step guide to playing jazz with confidence and style. Designed for the absolute beginner, it breaks down the process into simple yet fun activities, with many musical examples to illustrate the points made. The accompanying CD provides examples, activities and some great trio playing to use as a backdrop to the student's own work. Together with a range of other supporting materials - pieces, scales, quick studies, aural tests and more - this book/CD pack provides a comprehensive introduction to the world of jazz. organized into parts: "Starting Out," which begins with a rhythm workshop, and goes on to pitch, chords... on to "Moving On" - playing standards, 12-bar blues... It finishes with Preparing for the Assessment. The book also includes a nice short listening guide, though not all the albums are so easy to find. From here, students use the other books from the Jazz Piano series -charts including a melody/accomp and a comp page for improvising. In my opinion, and use, one of the best out there for teaching Jazz Piano. I also have used Lee Evans' series of books which is an alternative (for those with less patience perhaps), but not as thorough, or for my students as successful.